Get the most out of your next trip with the Dollar General Mobile App. Get coupons, browse Weekly Ads, find a Dollar General location nearby and more, all from the convenience of your mobile device. Save even more on the go with DG Digital Coupons. Sign up or log in with your existing account and find over $200 in coupon savings on your favorite products and brands. Browse through all available coupons or find the offers most relevant to you with smart filters and sorting. +ADD coupons to your account and redeem at checkout with your phone number. Mobile Coupons make saving quick and simple. Browse the available coupons, select the offers you’d like to redeem, and present the offer barcode for the cashier to scan at checkout. Never miss out on the latest sale prices or everyday savings. Search by location to find Weekly Ads for stores in your area or select a Favorite Store using the Store Locator. Scroll through the Ad pages to view all the in-store savings. Click or zoom in on specific products and offers for more details. Search a specific area or use your current location to find the Dollar General location closest to you. Click on any location on the map to set it as your Favorite Store, view store info, call the store directly or receive turn-by-turn directions from your location. 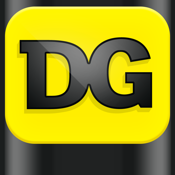 · Shop Online: Shop DollarGeneral.com by Featured Products, Category or Brand Name with handy links. · Stay Connected: Keep up with Dollar General store sales and special savings events with interactive Social Media feeds. · Get Inspired: Check out delicious recipes with DG Easy Meals, get tips on saving For The Home, and learn from pet experts with the DG Pet Center; all just a click away. Enable Geo. Notifications on the Settings screen for extra savings and exclusive offers. Please note: Continued use of GPS running in the background can dramatically decrease battery life. DG Digital Coupons Members: To report any technical concerns or feedback, please use this form: http://dolr.us/rdb.